The Government Accountability Office has issued a report to Congress regarding NASA’s James Webb Space Telescope, noting the significant risk of additional launch slips beyond June 2019 and the potential for the project to reach and even breach its $8 billion (USD) cost cap. The report follows the most recent launch delay, announced in September 2017, and expressly states that the telescope’s prime contractor, Northrop Grumman, is the project’s critical path to launch. According to a Government Accountability Office (GAO) report submitted to Congress Wednesday, 28 February, the James Webb Space Telescope is in danger of slipping even further beyond its current March-June 2019 launch window due to ongoing issues with integration and testing operations and prime contractor optimism. NASA’s James Webb Space Telescope, set for launch NET 2019. 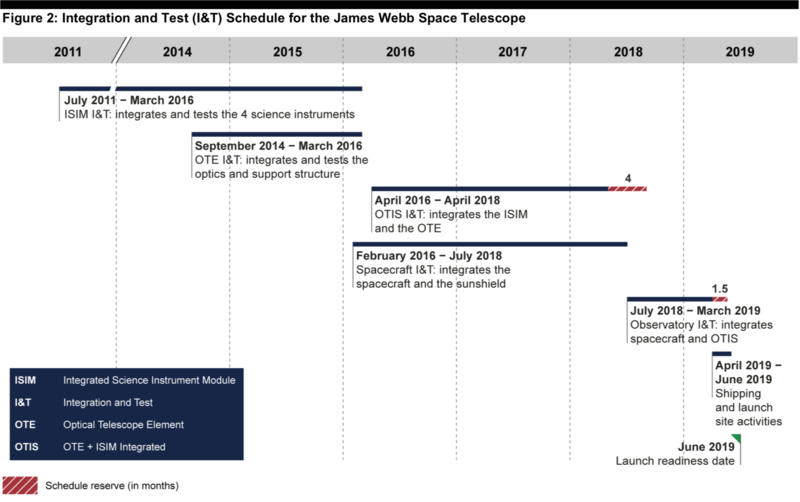 The report specifically notes that at the end of February 2018, only 1.5 months of schedule reserve remained, meaning the James Webb Space Telescope (JWST) now carries an earliest possible launch date, at this point, of No Earlier Than May 2019 – assuming no issues occur between now and launch. But with additional delays likely as integration and testing operations continue, the spacecraft’s launch on an Arianespace Ariane 5 rocket will likely be delayed beyond the current March-June 2019 window. Perhaps most notable is a summary finding of the GAO, which notes that “ For several years, the prime contractor [Northrop Grumman] has overestimated workforce reductions, and technical challenges have prevented these planned reductions, necessitating the use of cost reserves. 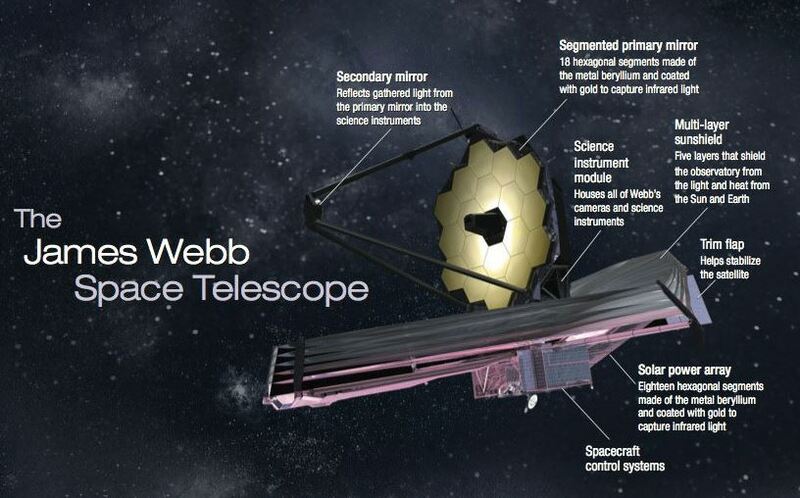 The $8 billion spending cap and October 2018 launch date were established during a JWST program replan in September 2011. This replan followed an October 2010 requested report by NASA in which the agency highlighted the original budget, schedule, and subsequent budget changes that made the JWST project’s original plan and budget untenable. By December 2016, the most recent GAO report to the one issued two days ago, the government found that JWST was still on track to meet its October 2018 launch window, still had six months of remaining schedule reserve heading into 2017 (the most risky – from a schedule slip and cost increase perspective – period of development), and was on track not to exceed its spending cap. However, a vibration test anomaly in February 2017, spacecraft sunshield testing issues and workmanship errors, and Northrop Grumman’s underestimation of “time required to complete integration and test work on the spacecraft and other risks identified in the schedule risk analysis” used up that remaining schedule reserve, leading to the September 2017 announcement by NASA that the JWST was slipping to a March-June 2019 launch with the agency adding four months of new reserve to hold the new launch window target. NASA therefore decided to add 2-3 months to the schedule from what Northrop Grumman said was expected, an additional 2 months for emerging technical issues not specifically accounted for in the schedule risk assessment, and an additional 1.25 months for launch site processing activities. 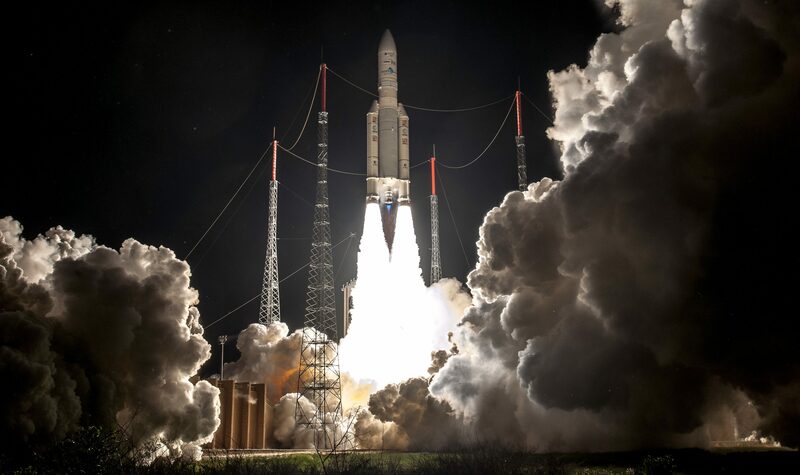 All of that led NASA to request from the European Space Agency (ESA) a revised launch window of March-June 2019, which in addition to more properly matching likely timelines for JWST would also help Arianespace deconflict JWST with two 2018 end-of-year launches – including ESA/JAXA’s BepiColombo (which would have taken precedence over JWST as BepiColombo is an interplanetary mission) and a commercial launch scheduled for December 2018. NASA and Northrop Grumman looked at the remaining schedule for JWST at that point and implemented a few schedule efficiency options to buy back 14 days of reserve, now leaving the agency with just 1.5 months of schedule reserve with over a year to go until launch. However, this 1.5 months of remaining schedule reserve to meet the new launch window is “below the standards established by Goddard Space Flight Center for a project at this stage of development,” notes the GAO report. 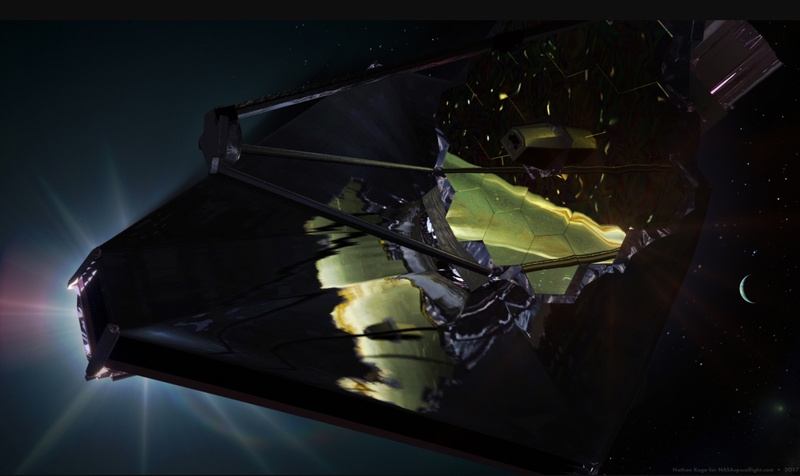 At this moment, Northrop Grumman’s work on JWST remains the project’s critical path toward being able to launch at the end of the newly aligned window in June 2019. Contributing to this conclusion is the fact that 8 of 16 of the spacecraft’s propulsion system thruster modules were found to be leaking in May 2017 due to a solvent used for cleaning. The thruster modules were returned to the vendor for investigation and refurbishment and now must be installed in a manner different than originally intended so as not to damage critical electronics. 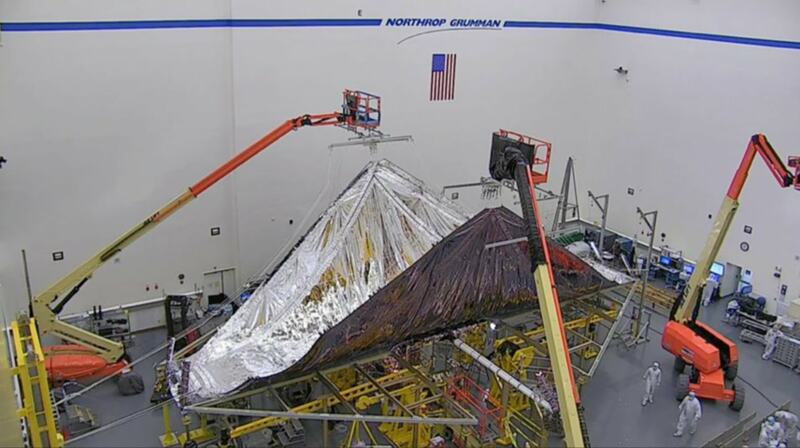 Additionally, in October 2017 while Northrop Grumman was conducting folding and deployment tests on JWST’s sunshield, the contractor discovered “several tears in the sunshield membrane layers … [caused by] workmanship error” as well as a snag in the sunshield six membrane tensioning systems – both of which needed to be understood and corrected before sunshield testing could continue. A complete update on JWST’s status from NASA is expected in early 2018 in a Standing Review Board report to program and project management regarding JWST’s schedule and feasibility for meeting its new launch window. If that report finds that the telescope cannot meet the March-June 2019 window, the Standing Review Board is expected to recommend a new launch window.